Zara Hadid has identified a new approach to architecture thanks to her gravity defying designs, multiple perspective points and fragmented geometry. Her innovative structures encompass curved, futuristic features combining steel and glass to create the main focal points of her architecture. Home to three Olympic pools Hadid was responsible for designing the London Aquatics Centre. Capable of housing up to 17,500 spectators at any one time, the venue will be used for the swimming, synchronized swimming, diving and water polo Olympic events. Double-curvature geometry has been used to create a parabolic arch formation that provides the unique roof structure which is intended to visually resemble the form of a wave. Maximum levels of natural light have been achieved inside by utilising glass surrounding the swimming pools and spectating areas. 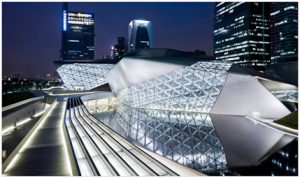 Another impressive structure Hadid has designed is the Guangzou Opera House, consisting of two asymmetric structures suggestive of fluid forms against an urban backdrop. Opening in 2011 it is the third largest performance area in China. Shaped to resemble two pebbles on the bank of the Pearl River the opera house is built solely from glass and granite panels. The angular design provides views into the main atrium and enables it to flow out at all angles, therefore allowing the building to be flooded with daylight at all times. Glass designs are recognised globally as being the future of innovative architecture. With a broad range of glazing solutions at Pilkington, our project references on our website highlights a variety of buildings, where glass has been used as a key feature. Have a look at Pilkington Planar™ structural glazing systems which can be used to stunning effect. To read more about our extensive range and the vast amount of advantages of all our glazing solutions, please visit our official website and have a read through our different ranges.